There’s nothing quite like a fresh batch of chocolate chip cookies. The best recipes (and a decent oven!) create a buttery crunch on the outside and a chewy, chocolate-and-walnut infused center. Of course, every ingredient of the recipe is necessary—not just the chips and nuts. You have to include the flour, butter, eggs, and more. Leave one out, and the results will be hugely disappointing. Take vanilla extract, for example. 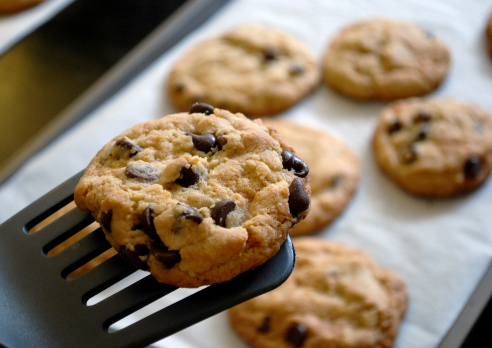 A batch of chocolate chip cookies is quite bland without that one teaspoon of flavoring. But have you ever tasted vanilla extract all by itself? Whew! It is shockingly strong and bitter. Now try this idea on for size: Our lives are a bit like chocolate chips cookies! Just as it takes a variety of ingredients to make delectable cookies, it takes a variety of people and circumstances to make our lives into “the aroma of Christ” (2 Corinthians 2:15). Some ingredients, like chips and walnuts, can be enjoyed all on their own. Similarly, God’s recipe for each of us also includes blessings, provided solely for our pleasure—all on their own. But then there’s that vanilla. So awful by itself; so transforming when combined with the rest of the ingredients. I see that vanilla as representative of the distasteful and bitter experiences God allows in our lives. Without them, we’d end up as bland and good-for-nothing as vanilla-less chocolate chip cookies. Would Joseph have been as prepared to be second-in-command under Pharaoh—without being sold into slavery or thrown into prison? Probably not. He learned invaluable lessons about organization and leadership while overseeing Potiphar’s household. Those skills only increased while Joseph was incarcerated and given responsibility for all that was done in the prison. Would David the shepherd boy have become the greatest king of Israel? Undoubtedly, his perseverance and faith grew strong as he struggled through fifteen years of waiting—and hiding in caves from Saul. Would Paul’s ministry have been as effective to the persecuted Christians of the first century, if he himself had not been exposed to great suffering? We must be willing participants. …God uses the bitter moments to work wonders in our lives. Heavenly Father, I praise you for your infinite wisdom. You know exactly what to allow into my life to achieve your ultimate purpose. I thank you for the blessings but also for the trials. May I be a willing participant, like Joseph, David, and Paul. And may I become strong and resilient as they were—for your honor and glory. Amen. It’s easy to see and appreciate in hindsight, but I fear I’m a horrible moaner in the midst of suffering. Here’s to building endurance and character, eh? Oh, yes, the hardest seasons shape us uniquely for things to come. Very well said, Rebeca! And I have to agree with you, in the midst of suffering, it’s a severe challenge to remain positive. Then again, David in the psalms and a number of the prophets gave us plenty of examples of honestly expressing doubt, discouragement, and worry. But they also affirmed hope and trust in God to see them through. Thank you for YOUR honesty, Rebeca! Even decades later one trial in particular has enabled me to help another person with a similar trial she has experienced. And I am still learning from this myself. Another thought: It makes me feel better than even great men of God also expressed a shaky faith during their trials; but He was preparing them for later blessings and to be tools He could use in the spreading of God’s Word. Great post! Thank you, Cheri, for the meaningful observations about the positive outcomes of trials. The longer the list, the stronger the armor against discouragement and self-pity! I am in total agreement with your words: “Every person, every situation God allows into our lives has the potential to make us like Jesus.” If the situation doesn’t work for my good (IN THE END), I don’t believe God allows it to come near me. I’m going to think about this every time I see Chocolate Chip Cookies. Thank you, Jerralea. Your last comment made me smile! And I’m delighted you chose to become a follower. My prayer is that you’ll find the posts meaningful. Thank you, Jean. Glad you enjoyed the metaphor. Yes, I did use chocolate as a theme for two posts, rather close together, didn’t I. Funny how that happens sometimes. As for cookies with a CUP of baking soda? Oh, my. I can only imagine how distasteful they were! He is the P̶o̶t̶t̶e̶r̶ Baker, I am the c̶l̶a̶y̶ cookie!